Soapstone, also called potstone, steatite or saponite, is actually just an impure form of talc. We call it soapstone because of its soapy feel. Aside from carving, soapstone (talc) is used as filler in paint, paper, rubber, linoleum, tile, soap, plastic, insecticides, cleaning compounds and cosmetics. Soapstone can take high temperatures and acids, and is nonconductive, making soapstone a good choice for a laboratory tabletop or other lab equipment. Soapstone is also used like chalk for welding, because the heat won’t burn it away. But before all the modern uses, soapstone was made into oil lamps, pots, kettles, charms, children’s toys and shapes that may have had meaning only to the artists who carved them. Soapstone has been a part of human development since we first started banging rocks together. No one race or area should be thought of as the original soapstone carvers. It has become common when referring to soapstone to think of northern Canada and Alaska. People attribute soapstone carvings to the Inuit, Eskimo Art. While the inhabitants of the far north have been carving soapstone since before recorded history, it is only since the 1950’s that this art form became popular to art collectors. James A. Houston is credited with introducing Eskimo soapstone carvings to Montreal. Worldwide interest in Eskimo (or Inuit) art grew from those first exhibits. 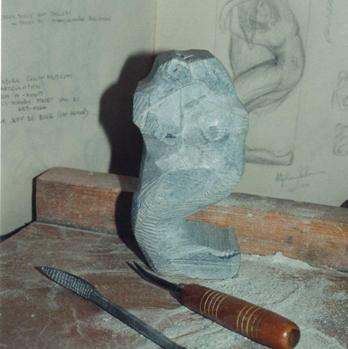 Given the popularity of Eskimo art we forget that soapstone has been carved all over the world. 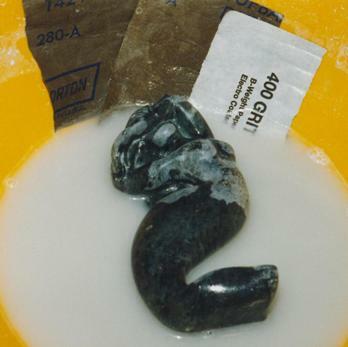 The Egyptians and Babylonians often carved raised stamps out of soapstone. These stamps made their mark when pressed into wet clay. India is known for cooking pots, statues, and even palaces made of soapstone. 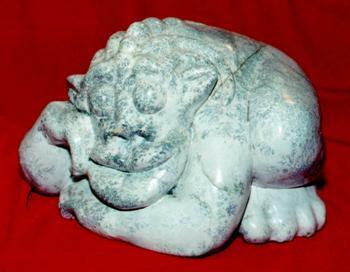 The Chinese, while best known for their jade and ivory, also carve figurines from soapstone. 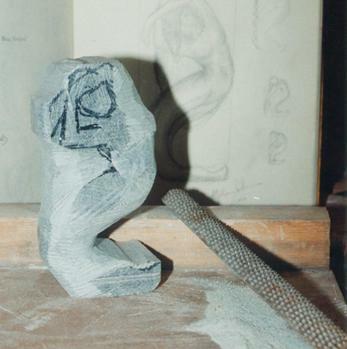 Soapstone is often the first type of stone carved by apprentices. Unfinished soapstone often looks grey. The finished stone may look grey, black, green, yellow, orange, rust, pink, bluish, white or combinations of these colours. It’s the presence of different minerals mixed with the talc that causes the differences in colour. (For example: the red colour often comes from iron.) These other minerals will sometimes cause the stone to be harder. With so many variations it’s no wonder that soapstone has become a popular medium. A fingernail can scratch soapstone. You can carve it with sticks and stones and polish it with stone dust and fat. That’s what people did in ancient times. Nowadays there is a wide range of inexpensive tools that may be used to carve soapstone, or we can buy all the neat power tools and really make the dust fly. You can start with the idea, or start with the stone. If you start with a piece of stone, you might decide what is within the stone. (For example: a face, a bird trying to fly, a salmon leaping from the water...) The stone might give you hints of what it could become. Study the stone. Touch the stone and get a feel for it. Cut away those parts that you feel don’t belong. Of course there is a problem with this method. You might not find an image, and just end up with a bunch of smaller pieces and a pile of soapstone dust. If you don’t want to explore each stone trying to find inspiration from within, you can plan out your design before you start carving. Look at pictures and do some sketches. Once you have your idea down, find the stone that will fit it. For example: let us say that you want to carve a mermaid. Find some pictures of mermaids. Decide on a pose. Draw some sketches from different angles. 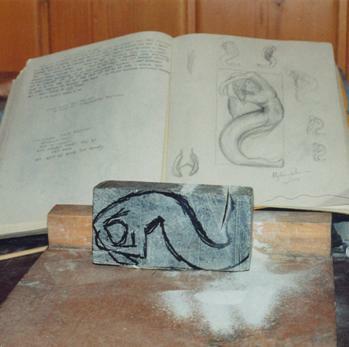 Get a piece of stone that will fit your design, or change the pose of your mermaid to fit the stone you have. Use a pencil or felt pen to draw out your mermaid on each side of your stone. You will want to draw the shape of your mermaid from the top, sides, front and back. This will help you when you start cutting bits away. Cut slightly larger than your outlines. Allow for later adjustments with finer tools. Never forget that once you cut a chunk away you can’t put it back. Soapstone is easily cut with a wood saw. Initially your piece may need large areas removed. It is better to cut these areas out with a saw, because to file or rasp them away will take more time and produce more dust. Rasps are excellent tools for shaping soapstone, but be careful not to rasp away too much stone. When you are filing, stop now and again to look at and to feel your stone. Always keep in mind the shape you are trying to obtain. 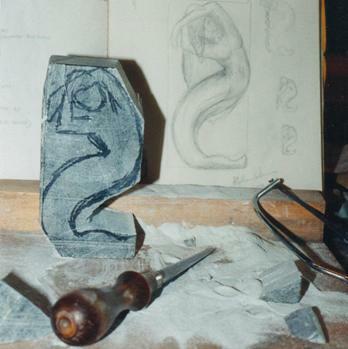 After the filing and rasping you should have your mermaid shape roughly finished. Now it is time for sandpaper and/or steel wool. You may start with a 200-grit sandpaper, or course steel wool. Use finer and finer grits of sandpaper, to make your carving smoother. A low dust method of sanding is to use a pan or bowl of water and wet & dry sandpaper. Sand your stone over and/or in the water, rinsing it now and again to remove the build-up of soapstone dust and paste. Keep your eyes open for items that could be used as tools on your stone. I’ve found a nylon pot scrubber works well in place of some grades of wet & dry sandpaper. A rounded piece of wood, like a pencil, a bit of glue and some sandpaper will make a great rounded file. Once your stone is smooth, with no scratches, and you’ve seen the colour of your stone when it’s wet, it’s time to decide on a finish. Oiling is an easy method: even cooking oil will work. Just rub the oil onto the stone with a soft cloth. Remember how easily it scratches. It’s best to remove any rings or jewellery that might scratch the stone. Oil often needs to be reapplied as it seems to soaks into the stone or evaporate to some degree. You can instead wax your stone using a furniture wax or even a floor wax. You can heat your stone and use beeswax or paraffin. To heat the stone, put it in an oven at 200° F for 10 to 15 minutes, or put the stone in a sink and pour hot water over it, but if you are using hot water you will need to dry the stone before applying the wax. Rub the wax onto the hot dry stone, it will melt and soak into the stone. DON’T BURN YOURSELF. The stone will retain the heat for quite a while. You can make up a wax mixture that can be applied to hot or cold stones. Heat the wax in a double boiler until the wax is melted. Remove from the heat and mix in the turpentine. This mixture can be stored in a wide mouth mason jar, and is easily applied with a clean cloth. If you like the dry grey colour of your stone, you don’t have to finish your stone with a wax or oil polish. Some Inuit pieces are unfinished by design. 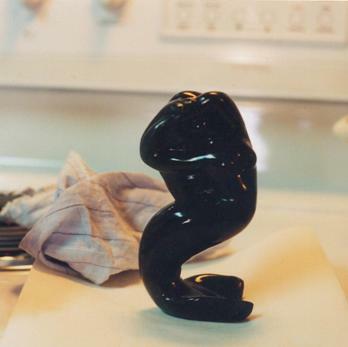 I’ve seen an Orca (killer whale) carved out of a very dark piece of soapstone. The black areas of the whale were polished with wax. The white areas of the whale were left the natural grey of the stone. Some artists will polish the whole piece and then mask off the areas they want to remain polished and sand blast the areas they want to be grey. There is no right or wrong way to finish your stone. It’s your piece and you are the artist. 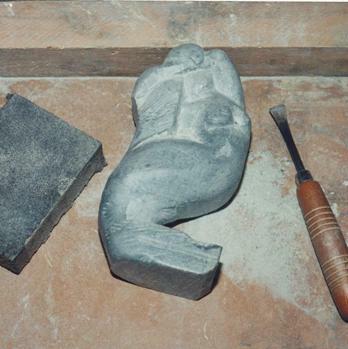 In your exploration of soapstone carving always think safety. Soapstone is a soft rock, but it is a rock. The tools that you use can more easily cut you than they cut the stone. If you are using woodcarving tools, always carve away from you. Remember your other hand is holding the stone. If your tool slips it is going to cut you? A wooden carving platform can help protect the table you are working on and help to hold your stone in place. A bench hook is an easy thing to make. All you need it a board about 12” by 12” and two 2x2 by 12”. Nail or screw the 2x2s onto the board as seen in the diagram above. The bench hook rests on the table so that the front 2x2 overlaps the edge of the worktable. You push your stone against the back 2x2 and the stone won’t go anywhere. There is much less chance of you cutting yourself as you work on your stone. If you are not careful soapstone dust is going to get everywhere. Work on layers of newspaper, that way you can carefully fold up the top layer every time you start getting too much dust building up. Having a Wet & Dry Shop Vac is a good idea. A regular vacuum can have trouble with soapstone dust. If a lot of dust is getting into the air you should wear a dust mask. Soapstone dust is inert, but you don’t need it in your lungs. If you are chipping away stone with a chisel, please wear goggles to protect your eyes. It might be a good idea to wear gloves too. It has been pointed out to me that it is inappropriate for me to post information online without quoting my sources. As I do not remember all the sources for what I know, much of it gathered by word of mouth, I have decided to add a list of possible sources and other places to find similar information. Mrs. Mitchell – was my grade eight Art Teacher (1974-1975), who introduced me to soapstone and its beauty. Mr. Fulton – my grade eleven and grade twelve Art Teacher (1977-1979), who told us that we should try every medium of art we could, while we were in school, because if we didn’t try it then it would cost a lot more when we had to buy all the equipment and materials ourselves. Miss Morton – another of my Art Teachers for grade eleven and twelve (1977-1979). She said that we should do all the projects and exercises, because you learn by doing. I should really be listing all the teachers that taught me art, all the way from kindergarten, but I must admit I have forgotten most of their names. I took Printmaking through Camosun College (1986 and 1987). For the life of me I can’t remember the teacher’s name. She told us that we could use soapstone, wood, Plexiglas, linoleum and other materials for making prints. She taught me about woodblock prints, and how to carve them. E. B. Klassen – Bernie is a woodworker, writer and artist. He taught me that sometimes the old way of doing something is better, but you have to be open to new ideas too. There are many more artists and carvers that I should mention, but let’s not get carried away. Karl Johanson – Karl, while he used to claim he wasn’t an artist, has a natural ability to come up with different ways to create. Karl is also the one who keeps reminding me that safety is of first importance. I would like to thank all my students for showing me that I don’t know everything about soapstone or carving, and for giving me so many chances to learn more. Encyclopaedias – some examples: Encarta, Funk & Wagnall’s Encyclopaedia, Encyclopaedia Britannica, The World Book Encyclopaedia and many more. There are so many more books I should list, but those give you an idea of where to get the information.